Our district began a big Kindergarten Readiness push about 6 years ago. Our school really started pushing for making sure kinders were ready when school started. We began by really trying to make sure all those kiddos that would qualify for preschool were targeted and enrolled. It never failed we would get incoming K students who had never attended preschool because their parents didn't know it was available. Huh? How could they not know it wasn't available. We also began "assessing" kinders in late April to see if they were ready for K. This was all done in a game like setting. We assessed on letters, sounds, colors, shapes, and numbers. Our principal then sat down and talked about what things the parents could be working on throughout the summer so that their child was better prepared when school began. We also gave all parents these PATT Mats from Frog Street Press. I love these! 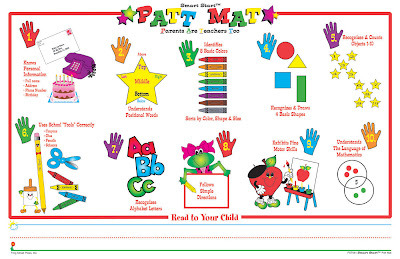 PATT stands for Parents Are Teachers Too. They have so many great activities to work with your child. The front is colorful and fun and the back explains each activity and what to work on in detail. We always right their name correctly (the way we want them to learn it) at the bottom so they can work on that as well! In the past, we held a ABC and 123 night throughout the summer and gave out lots of prizes (cookie sheets and magnetic letters) to work on activities at home. The past couple of years we have had not as good attendance due to ballgames and vacations, so we did it all in April! My favorite part: We put a name with a face. I love that we can identify the kiddos when we make class lists and I think they are a little bit more comfortable with us too. What do you do to get your kindergartners ready? I love the PATT MAT. We also assess students who are registering for the next school year for kindergarten in May. We assess on letters, numbers, shapes, and colors. Two weeks before school starts we have a kindergarten camp. Parents sign their soon-to-be kindergarteners up in May-June for a 1 wk kinder camp that lasts a week 8-12pm. Each K teacher (5 of us) have btw 10-17 kiddos learn about procedures and we do fun activities so they get a feel for kindergarten. It really helps them be comfortable for when school starts and let's us see what kind of kiddos we will have.